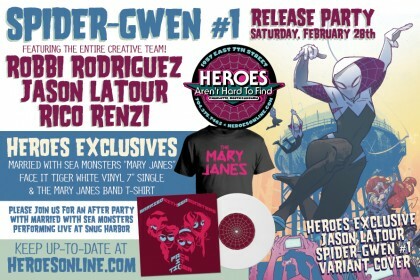 The fun doesn’t end after our Spider-Gwen #1 Release Party. Join us for more fun and live music at Snug Harbor with special guests Married With Sea Monsters and Junior Astronomers! Don’t miss your chance to see these bands in this intimate setting. Married With Sea Monsters has been working on some new “Mary Janes” songs and this will be your first opportunity to hear them! Married With Sea Monsters became a sensation with their cover of The Mary Janes song “Face It Tiger” featured in Edge of Spider-Verse #2 from Marvel Comics and featuring the debut of the Gwen Stacy Spider-Woman! Local post-punk heroes Junior Astronomers always bring the ruckus! Nine?? PM?? At night? When all decent folk are already in bed trying to sleep off the Early Bird Special Grand Slam[TM] at Denny’s? Besides, I’d miss Matlock. If i was somehow able to make it to this incredible event, does the Ticket price include unlimited Ben-Gay? If not, I can bring an extra tube along. ← CHARLOTTE MINICON :: THANKS!